If transporting goods is a crucial factor in your business growth, you are already aware of the delicate balance it involves between time and cost-effectiveness. To that end, you need to carefully select the shipping methods, the best possible route, and the right shipping container. Let’s say you’re importing tools from China. If you are a retailer, you keep a close check on your inventory rotation. Does it make better economic sense to ship often in smaller batches, or wait long enough that you can order a full container? For that matter, should you fill a 20’ container, or a 40’? Buying more products will offer scalability and potentially higher discounts from the vendor. In any case, when you are shipping in a commercial capacity, always break down the costs for each type of goods. In some cases, a less than full 40’ is more cost-effective than a full twenty-footer. In multimodal business transport, shipping lines, ground trucking companies and docks are equipped to handle a variety of containers. Standard sizes mean no need for special lifting crane, modified truck beds, and specially trained handlers. When selecting a commercial container type, always make sure your freight forwarder provides equipment that obeys international standards. These general purpose containers will accommodate a maximum cargo weight of 28.2 tons or a volume of 33m3, whichever is reached first. 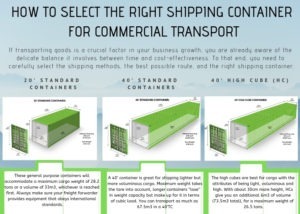 If your cargo combines the attributes of being light, voluminous, and generally high, HC containers are a good option to consider. With about 30cm more height, HCs give you an additional 6m3 of volume (73.5m3 total), for a maximum weight (cargo only) of 26.5 tons. There are many different containers suitable for commercial transport. We’ll reiterate the fact that to be the most efficient and profitable, your selection must factor in the type of goods, the velocity of your supply chain, as well as shipping lines options. Your freight forwarder is the best partner to help you determine the best solution for your business shipping and logistics needs.